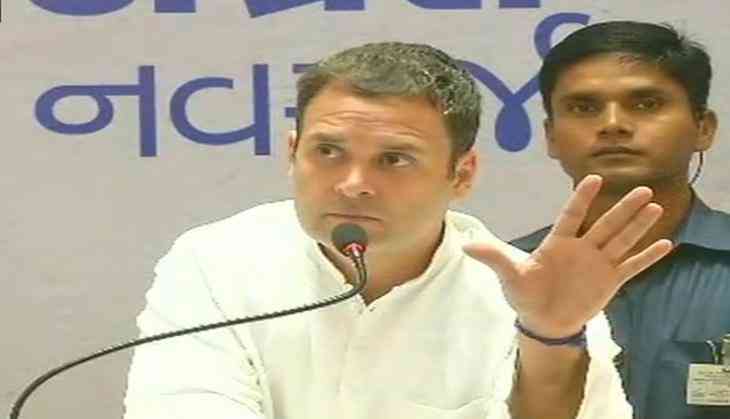 Taking a jibe at Prime Minister Narendra Modi, Congress president-elect Rahul Gandhi on 12 December said flying in a sea-plane is good but is a distraction as well. "Modi ji agar seaplane mein udna chahte hain toh kuch galat nahi, acchi baat hai lekin ye ek distraction hai, asli sawaal hai 22 saal mein janta ke liya kya kiya (There is nothing wrong if Prime Minister Modi wants to fly in the sea-plane, it's a good thing. But it's a distraction. The main question is what did he do for the people in the last 22 years)?" asked Rahul Gandhi, while addressing a press conference here. The statement by Gandhi was made after Prime Minister Modi travelled from Sabarmati River in Ahmedabad to Dharoi Dam via sea plane, which is the first-ever flight by such a craft in the country. Today is the last day of campaigning in poll-bound Gujarat before the final phase of state assembly elections. Remaining parts of Gujarat, including Ahmedabad, are slated to go for polls on December 14. The first phase of polling took place on 9 December and recorded a voter turnout of 68 percent. Counting of votes will take place on 18 December. The Congress is eyeing to dethrone the BJP government in the state. The last Congress government in Gujarat was led by Chhabildas Mehta from 17 February 1994 to 13 March 1995.